Facebook Reactions were introduced just a short-time ago and they’ve become rather popular, but not with the Belgian Federal Police. The Belgian Federal Police are warning their citizens not to use Facebook Reactions because they might be invading their privacy. The police are saying that Facebook Reactions are just another way for Facebook’s algorithms to collect data on its citizens. The post on their official websites says that Facebook Reactions can collect not only how you feel at any one time but also use that information to cater advertising to you more efficiently. From the official Belgian Federal Police website translated in Google Translate: Facebook never let pass an opportunity to gather more information about us. That proved to be seen again in February and to your emails, there are again many questions. It-I-like-duimpje think you already know. But many users complained that they could not express their dissatisfaction or did not indicate that they something not liked. But Facebook is also a marketing champion. From now measure our responses to the posts of our friends or watched pages. The icons help not only express your feelings, they Facebook also help assess the effectiveness of the ads on your profile. So this will help Facebook’s ideal location on your profile and also to determine the time to view content that can arouse your interest. It’s not clear if this is actually how Facebook Reactions work but we are reaching out to Facebook for comment and will update this post if we have any new information. 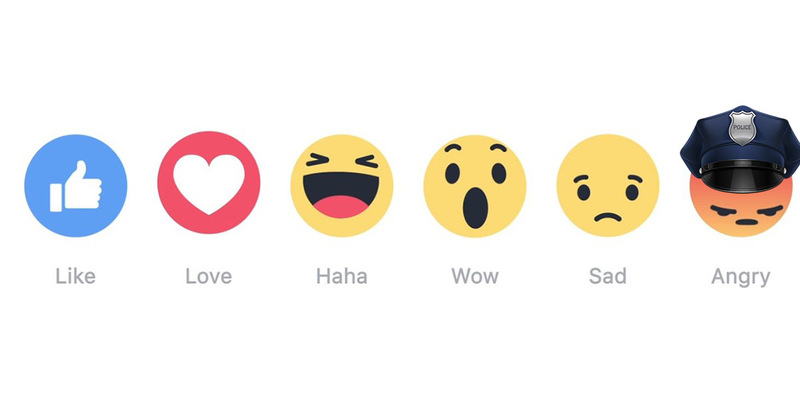 What do you think of the BFP’s reaction to Facebook Reactions? Let us know in the comments below or on Twitter, Facebook and Google+.